Okay, so my daughter wanted a Tinkerbell party this year for her 5th birthday. 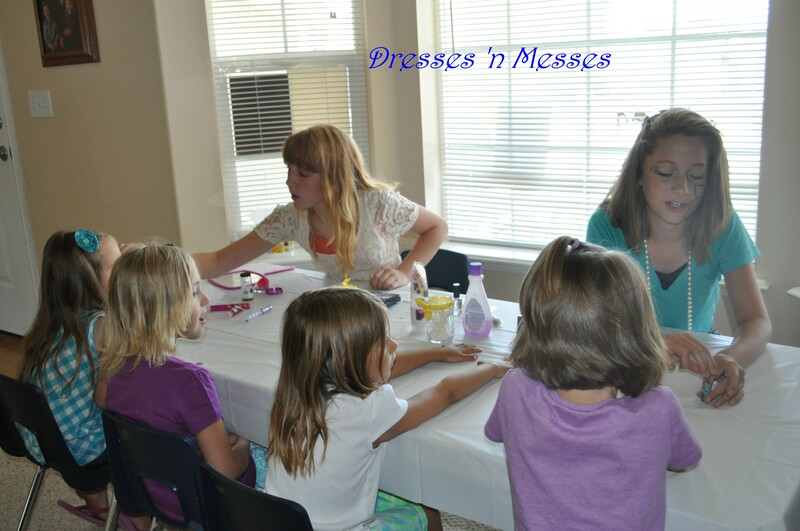 This was such a fun party to plan!! After four years of planning boy parties, this was a breath of fresh air–something I could do! There are so many things I could have added and wanted to do, but due to resources and time, I wasn’t able. But, the party was still magical and perfect in every way for us! Invitations: I couldn’t get this to add so I’ll just explain what I did. 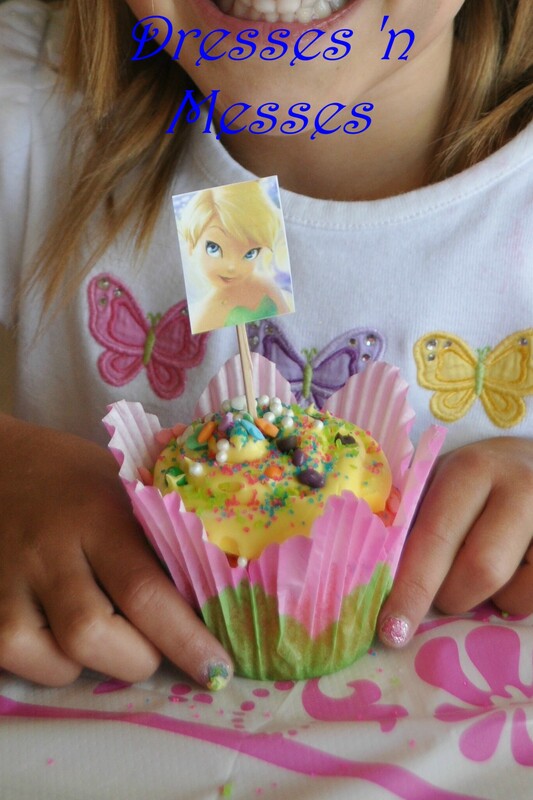 I found a cute picture of Tinkerbell on the internet, uploaded it into Word, and then typed the invite in cute purple font: Grab a little pixie dust and fly on over to (child’s name) 5th Birthday Party! (date, time, place) RSVP (phone number) Please wear your own fairy wings, if you want! We hope you can come!! We then made copies onto cardstock. I wasn’t able to purchase fairy wings for everyone in time so we asked them to wear them, if they were interested. If you want to purchase them, this site has the best prices, in my opinion! I’m very, very frugal and try not to spend more than 30 dollars per party (I may have spent a little more on this one), but I wanted to create a magical setting for my daughter; it matters to her! 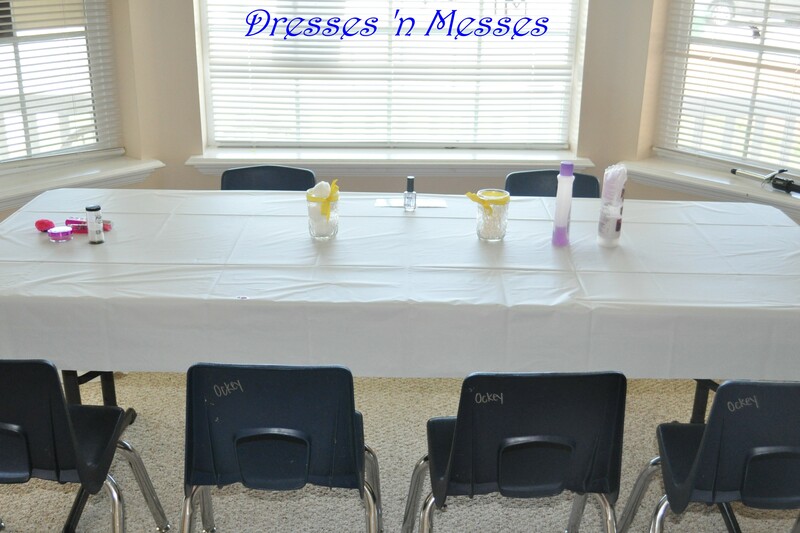 We had three “stations” (see the activities below) so I had three tables set up with chairs. I covered each table with plastic table covers for easy clean-up. 1. The first station was the tranformation station, where the girls were turned into fairies. Here they put on make-up and got their nails done (like a mini-spa). I kept things simple with decor here because you need space more than the cuteness (although I would have loved to have decorated the individual chairs!). My daughter set up the nail polish (cheap-o stuff I got at Walmart or the Dollar Store) because she really wanted to help. I provided body glitter, lip gloss, eye shadow, and yummy lotion. I also added Q-tips and cotton balls and nail polish remover for those girls who already had their nails painted. I also had a curling iron. And I think hair flowers would be cute, too. I also put a full-length mirror that we decorated with leftover tulle and flowers to jazz it up a bit (picture below). 2. The second station was our craft area. You can see the details below. 3. 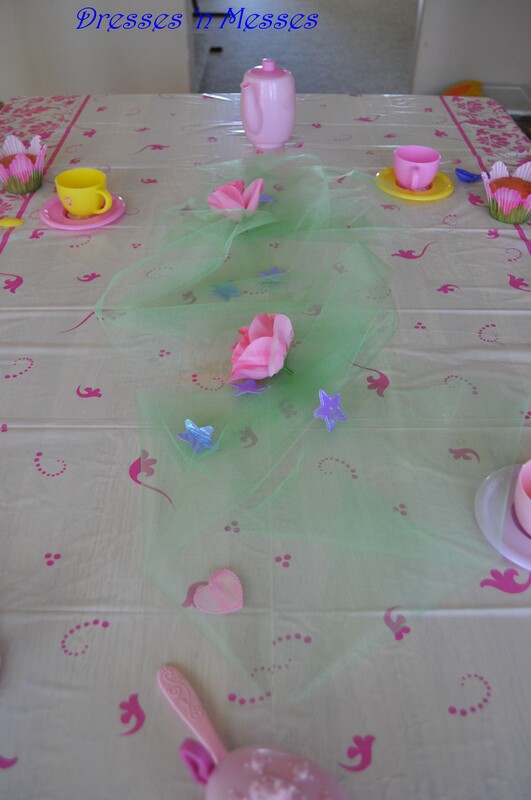 The third station was our Tinkerbell tea party and cake area. I spent the most time on this stuff. I wanted to make it girly and cute and still stick to the Tinkerbell theme, but keep it cheap, too. I got a cute, cheap plastic table cloth to cover the table. I put a piece of Tinkerbell green tulle in the middle and threw some fake flowers, fairy dust, and stars on it. 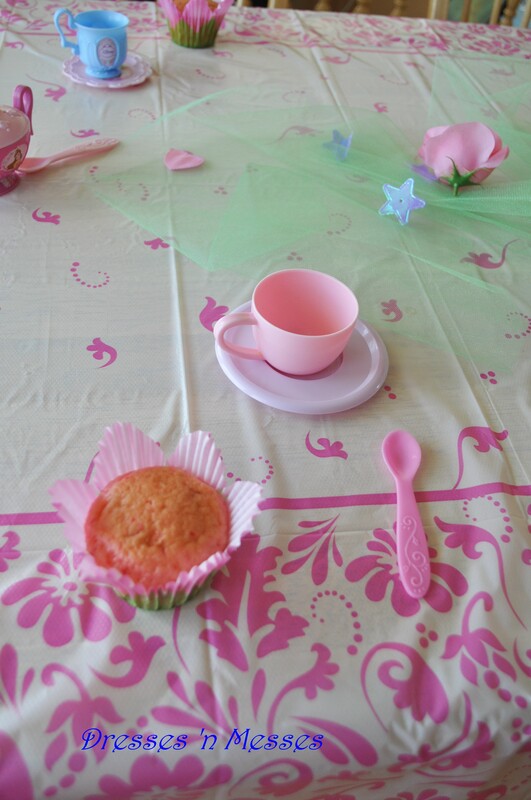 We set out tea cups and saucers and spoons for each girl, as well as their cupcake. 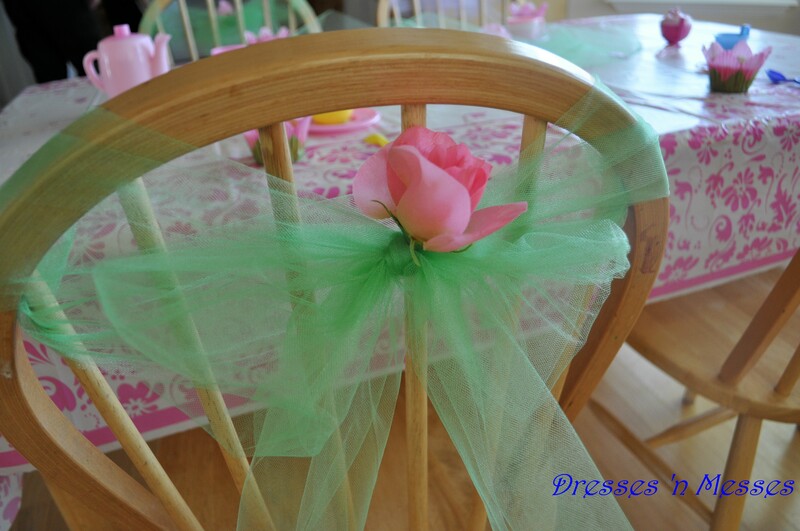 I also decorated each chair by tying a piece of tulle (green and purple) in a big bow and decorating with a flower. Simple but the girls thought it was fun! 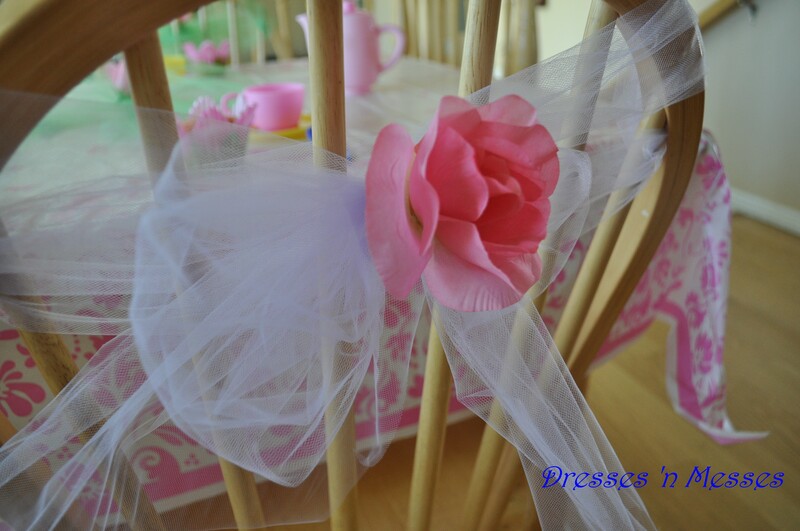 It’d be fun to use chair covers and then tie the tulle on! I also hid my chandelier by draping leftover sheer material I found in my scrapbox on it. I think it’d be fun to dangle butterflies or stars or flowers from it, as well. It was simple, but just enough to add a bit of magic to it all. 1. Transformation: I asked our favorite baby-sitter if she and a friend would come for about an hour or so and help transform the girls into fairies. I figured it would be more fun for the little girls than having a mom do it. These girls were amazing! They came decked out in fancy clothes and had face paint on. They began by telling the girls all about fairies and had them choose which type of fairy they wanted to be. They did their make-up and put a design on each girl’s cheek, based on the type of fairy they wanted to be. They used “fairy dust” in their hair, on their arms, on their sweet faces. And they did their nails, complete with stickers and lots of sparkles. We also did each girl’s hair, if they were interested (mostly just curls). The teenagers made it so magical. This was everyone’s favorite part! I had planned on it lasting maybe 20 minutes, but they went 45 before I finally had to end it so we could move on to the other things my daughter had requested. This could have easily lasted an hour; the little girls were in heaven! If I had gotten the wings for each girl, I would have included those as part of the transformation. I also thought it’d be fun to make each girl a tutu to complete the look. I did have some simple jewelry for each girl to put on. 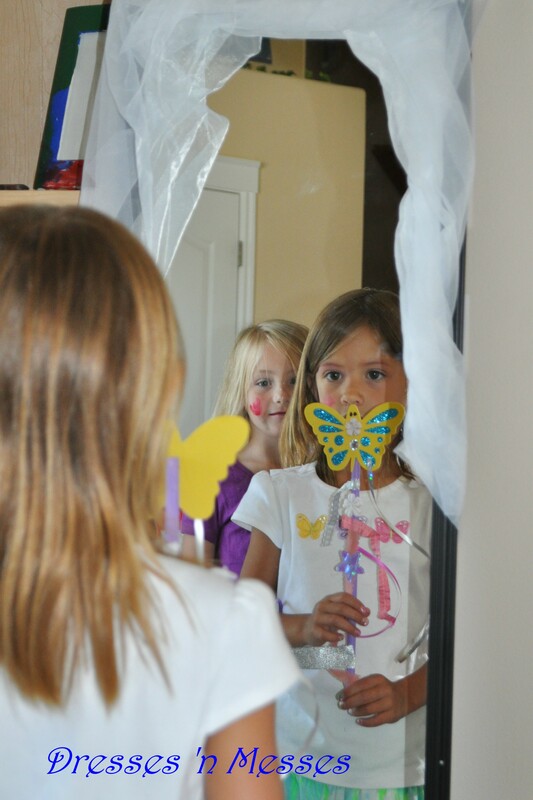 I decorated my full-length mirror and the girls loved looking at themselves in it. 2. Craft: Fairies need wands, right?! So, we designed our own wands. I bought wooden dowels and painted them purple (I didn’t want plain wood showing through and figured the girls wouldn’t cover their wands completely with ribbon so I thought the color was a nice touch). 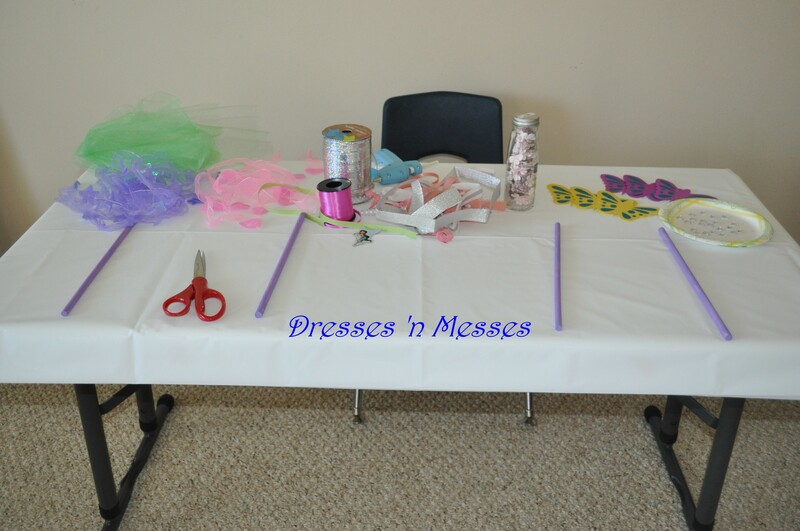 I then provided ribbon, flowers, butterflies, and sequins for them to use to decorate (most of these supplies I already had on-hand). I used foam butterflies to glue on the top, but you could do a flower, or a heart, or a bow or ribbon. I sat at the table with them and used a glue gun to attach everything. They loved the wands and spent the party flitting around with them! 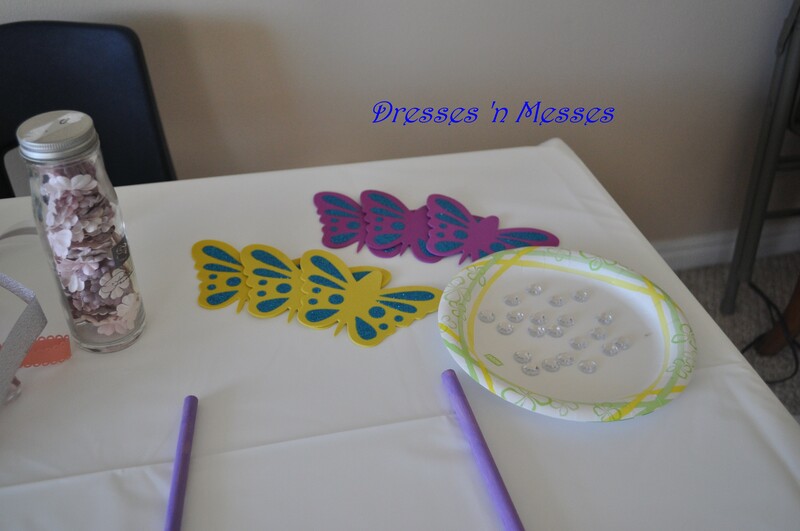 Close-up of the butterflies and sequins (wands and flowers also included). Each girl chose a butterfly to go on the top of her wand. 3. Pinata: My daughter really wanted a pinata so there you go–self explanatory. 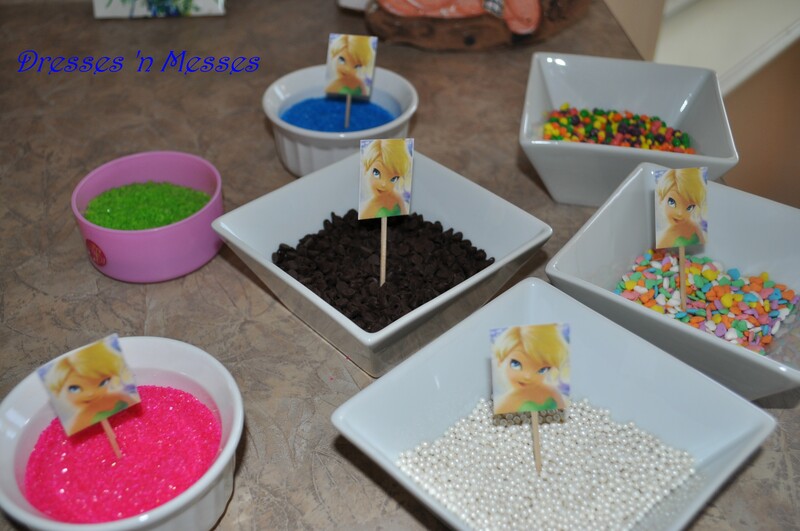 Besides candy though, we added lip gloss and other small fairy-like trinkets (you could do nail polish, bracelets, necklaces, bubbles). Personally I hate pinatas. I hate the rush and the tears when one child doesn’t get enough. Maybe it all goes back to my own childhood when I wasn’t aggressive enough and would stand back and wait, thus missing out. Unfortunately for me, my kids always request a pinata first so I oblige. But here are some tricks to help with the mad rush and chaos. Before we start, I always give every child a bag for collecting. I then set very high expectations. I set out a blanket for the kids who are waiting to sit on. They must wait on the blanket until it is their turn. When the pinata is finally broken, they get to collect a certain amount of surprises. That way everyone gets the same. When everyone has collected their allotted amount, I then divvy out the rest. It works for me. Less chaos. And no tears. 4. Cake: Because of my health, I had to go simple this year. There are really cute fairy/Tinkerbell cakes out there, but we went with cupcakes. 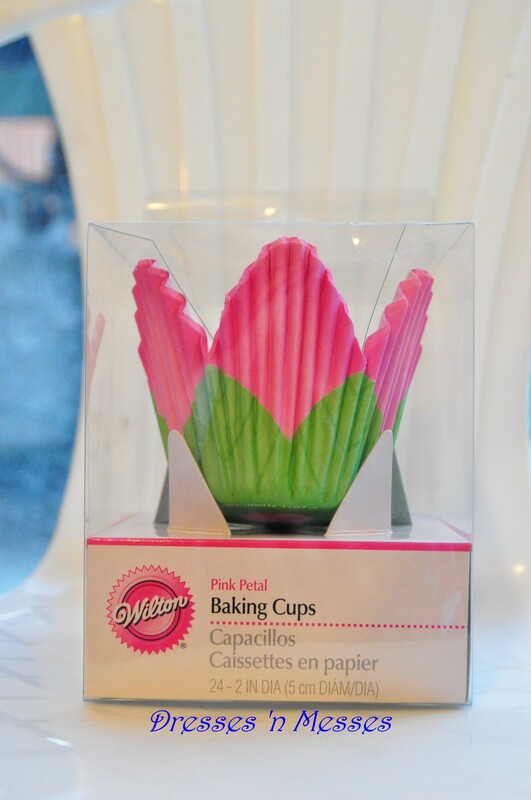 I bought these cute cupcake liners that looked like flowers, and honestly, they just added to the ambiance of the afternoon. The girls thought they were so cute, and I have to say, I loved them, too! I thought it would be fun to let the girls decorate their own. I provided “mini” toppings for their cupcakes. I told the girls that the fairies must have gotten into my baking supplies because everything was fairy-size that morning when I got the supplies out! I used those mini pearls, mini heart sprinkles, mini chocolate chips, Nerds, and 3 different colors of sugar crystals, which I called “fairy dust.” (I looked for mini marshmallows, like the kind you get in individual packets of hot chocolate, but I couldn’t find any in June–maybe in the winter?) I also provided each girl with a Tinkerbell cake topper, which I made with a clipart picture printed on cardstock and put on a toothpick. I added the frosting then so it would be fresh and the toppings would stick. 5. Tea Party: In addition to the cupcakes, we set up the table with tea cups for a tea party. 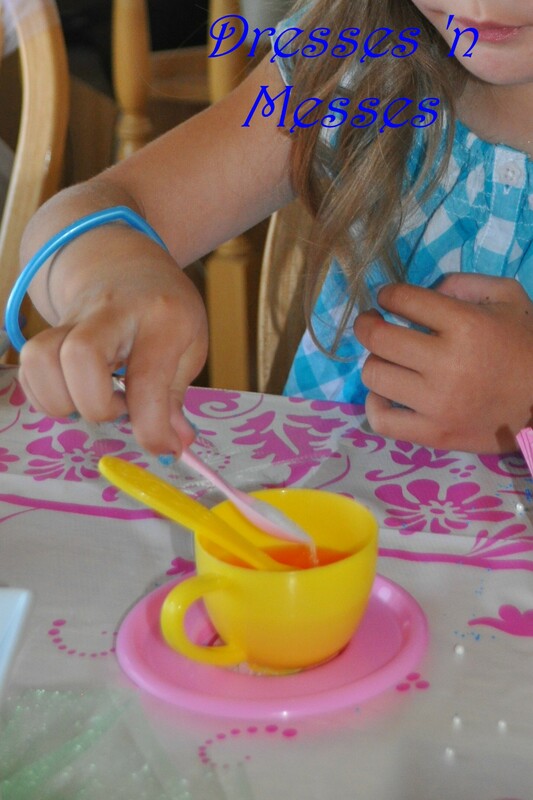 I provided a fairy drink (pink lemonade) and sugar for them to use. They loved pouring their own drink and mixing in the sugar. It was really sweet to watch. There is so much you could do with a tea party! If you wanted to go all out, you could do it over lunch or as a brunch and serve finger foods. And that was it! I had some games planned as back-up, but didn’t need them! This party lasted an hour and a half, but with the mini spa, I wish I would have made it last an extra half-hour. The girls had a blast!! Oh, as for take-home party favors, they got to take home their wands and pinata treasures so I didn’t do anything else! It would be fun to have some small containers of fairy dust that each girl could take home though, just to add to the magic. Melissa: Find the fairy. Hide a small light somewhere in a darkened room. Then have then try to find her. I know there is a pin on pinterest that has fairies in jar. Those could be made as favors with the kids in old water bottles or something. They look like glitter and glow stick juice in a liquid. Mine: Fairy dancing (or Freeze Dance): Play music and let the girls dance like fairies. Stop the music, and they have to freeze until the music starts again. You could also have one girl lead the other girls in moves (like Follow the Leader), like skipping or leaping or flapping their fairy wings, etc. Catherine: Hide little fairies (either toy, or paper copies from a storybook) around your yard and create a scavenger hunt. Catherine: The Tinkerbell CD is the cutes backdrop music for the party! Catherine: Or if you wanted to simplify you can have a Fairy Tea. Have the girls dress up and give them fairy tea (pink lemonade). They can frost and decorate cupcakes, a fairy storytime…you begin the story and have them make up the next line or two, using a box of funny fairy props. Have a grown-up write the story as it is told and print it out and mail (or deliver) it to each child as a thank you gift for coming to the party. Mine: A musical chair-type game: Put flowers cut out of paper on the floor in a circle (one less than the number of fairies) and dance around until the music stops. Game play is the same as musical chairs. Kris: I did one for [my daughter] years ago where we made wands out of big pixie stix with a star on the end and the girls decorated them. Then we made crowns out of ribbons and star garland. They had a fairy scavenger hunt where they had to sprinkle pixie dust (glitter) over the clues before reading them. Looks like lots of fun! Way to go. She is looking so grown up to me! I’m planning a fairy party and have a few friends with sons coming – ideas? How fun! Party planning is so fun, isn’t it?! 1. I honestly don’t think the boys will care too much. My 8-year-old son was totally into the fairy cupcakes as much as the girls. The boys will like the wands and the treats and the games. You could make the wands more “boyish,” if you’re worried. If the ones you bought are too girly, go buy some wooden dowels and decorate them with stars and glitter (think “wizard” for the boys). I think you’ll find you can easily adapt what you have for the boys, and they’ll use their own imaginations to fit. 2. I keep thinking about Terrence and the other builder fairies on Tinkerbell. You could make the boys pixie hats with leaves, like Terrence wears. He also has a lot of Pixie dust, which is cool. The builder fairies have little tools that you could provide for the boys, as well. 3. If you wanted to add more to the party, you could always do a Pirates and Fairies theme, like Peter Pan, and just throw in some pirate ideas (like treasure–gold coins and jewels, which the girls would love, as well). 4. You could call the boys elves or wizards. A cape for the wizards could be fun instead of the fairy wings.